The more things change, the more they stay the same — at least that’s the case in the nonprofit sector. Though the United States’ demographics continue to brown, organizational leadership is not on pace with these changes, and people of color are not given the opportunity to assume leadership positions even when they have more intimate knowledge of, greater proximity to, and a deeper affinity for the communities their organizations serve. 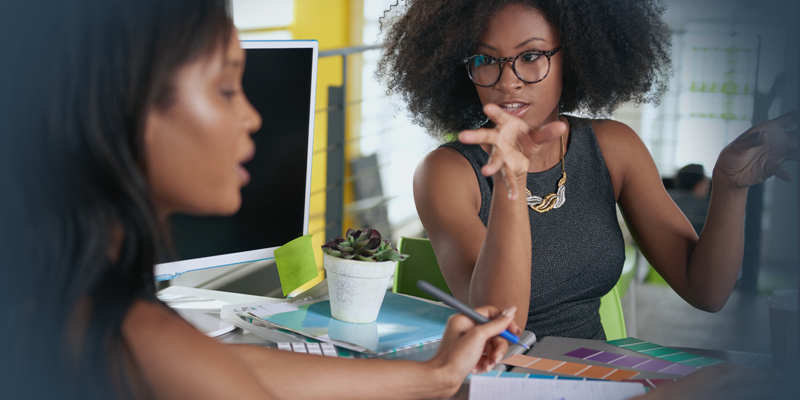 Recently, the Building Movement Project (BMP) released Race to Lead: Women of Color in the Nonprofit Sector, a report in BMP’s series that illuminates the racial leadership gap in the nonprofit sector based on data collected in 2016 via a national survey. The findings parallel the themes and patterns lifted up in Black & Bold. “Racial and gender biases create barriers to advancement for women of color. They report being passed over for new jobs or promotions in favor of others — including men of color, white women, and white men — with comparable or even lower credentials.” If one believes in the false promise of meritocracy, then the quality of one’s leadership should be enough to propel women of color into leading roles. But who defines leadership? There’s an inherent bias in what leadership means, and a white dominant narrative often obscures the richness of leadership diversity. Just like there are many ways of knowing, there are many ways to lead. This sentiment rings true for Nicole Brisbane, a New York executive director at Democrats for Education Reform. “Oftentimes, black women in the work space are constantly being criticized for one thing or another. I’ve seen it in almost every job I’ve ever had — whether it’s being micromanaged or critiqued for your style of leadership. Our commentary on the way work is being done is often judged as aggressive in white dominant culture. … Folks will try to mold you into what they think leadership looks like, but you need to define it for yourself." As I approach my twentieth year working in and with nonprofits, these findings were unsurprising. In many instances, my lived experiences mimic those of the women surveyed and the women I’ve interviewed. The duality of invisibility and hypervisibility, inequitable compensation practices, and “leadership” defined in a Euro-centric, heteronormative male paradigm prop up inherent inequities the social sector must remedy. An abundance of resources, books, articles, and TED Talks (see here, here, and here) exist to develop one’s anti-racist muscle, yet the movement towards becoming a more just, equitable, and inclusive social sector remains stultified. An organization that has proven what’s possible when intent and impact marry, resulting in tangible action, is Dēmos, a nonprofit public policy organization founded in 2000 “working for an America where we all have an equal say in our democracy and an equal chance in our economy.” In late 2018, the organization shared a tremendous gift by releasing a report that captures its approach to and lessons learned from its racial equity journey. Beginning in 2014, under Heather McGhee’s leadership, Dēmos set out to make equity real. With engagement from across the organization including the entire board and all staff, Dēmos launched its Racial Equity Transformation (RET) and invested significantly in a comprehensive redesign of its organization that centers equity. The transformation included several overlapping and ongoing phases of work, including a foundational analysis, an organizational assessment, education and learning, and implementation. From revamping candidate interview protocols to readings and discussions designed to help staff develop and deepen their “understanding of the social construction and history of race, color-blind racism, universal vs. targeted policy-making, and interpersonal skills (e.g., understanding white privilege and white fragility, racial anxiety and stereotype threat, and gaining skills in direct communication and feedback),” Dēmos offers a framework for other organizations seeking to start their journey toward equity. According to years of Leading with Intent data, nonprofits realize their boards are woefully homogeneous, yet few have any plans to address the lack of racial diversity through recruitment practices. Dēmos’s board fully engaged in the racial equity transformation and interrogated its practices and policies. 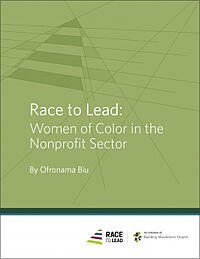 In many ways, the problems faced by women of color in leadership positions is aggravated by non-representative boards. Until organizational leaders shift from a place of complacency to a place of courage, like Dēmos, the potential of the social sector will remain unrealized.